Today, Lori posted pictures of her house at Christmas. This inspired me to do the same even though my outside lights don't even come close to hers. So without further ado, here are my lights. 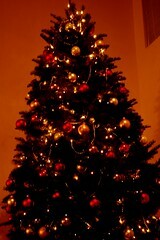 This is my tree. It's a real tree. 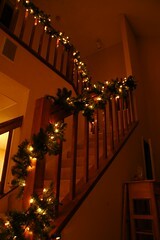 These are my stairs lit up like a, well, a Christmas tree. 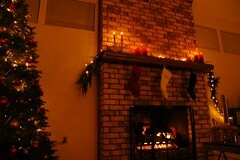 My fireplace in all it's glory. This is my attempt to put light on nandina bushes. 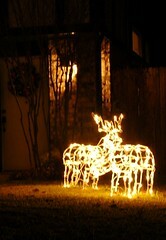 And the final glorious touch, my reindeer. And in the background, my wreath. Hmmm...Is This How They Look at Texas?